Contains Grapefruit (Citrus paradisi), Lime (Citrus aurantifolia), Cedarwood (Cedrus atlantica), Spearmint (Mentha spicata), Cypress Wood (Cupressus torulosa), Lavender (Lavandula angustifolia), Lemon (Citrus limon) steam distilled, Sweet Orange (Citrus sinensis), Vanilla (Vanilla planifolia, Vetiver (Vetiveria zizanioides) Description Focus Time Our lives get so hectic at times that focusing on a task at hand can be hard when we have a many other things on our minds. Release from chaotic thinking with Focus Time. 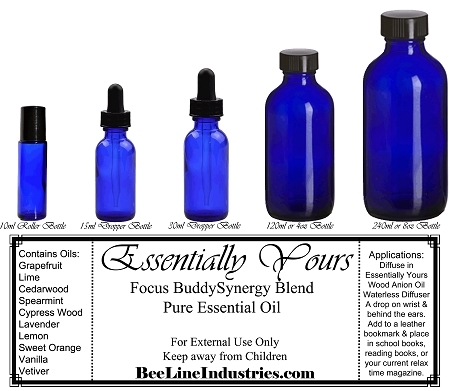 With a positive aroma layered with minty and earthy notes, Focus Time helps keep the mind firm and on task while increasing energy and positivity. Whether you have a mountain of work to do or need to continue equipped for the subsequent challenge, Focus Time supports mental precision with ease. Breathing in Focus Time as part of your daily routine does wonders for the workplace or classroom. Daily use also increases determination and motivation when driving, reading or studying. Applications Diffuse in intervals of 5 seconds on, 30 seconds off, with the Essentially Yours Wood Anion Oil Diffuser - Waterless, in your room while you work, or in your little one does their studying. Place a drop on each wrist and rub together. You can also take a drop and rub it behind your ears. You could also add a few drops to a leather bookmark and place in school books, reading books, or your current relax time magazine. Our lives get so hectic at times that focusing on a task at hand can be hard when we have a many other things on our minds. Release from chaotic thinking with Focus Time. With a positive aroma layered with minty and earthy notes, Focus Time helps keep the mind firm and on task while increasing energy and positivity. Whether you have a mountain of work to do or need to continue equipped for the subsequent challenge, Focus Time supports mental precision with ease. Breathing in Focus Time as part of your daily routine does wonders for the workplace or classroom. Daily use also increases determination and motivation when driving, reading or studying.